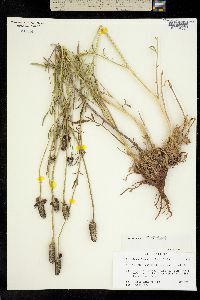 Perennials, to 105+ cm; taprooted. Leaves 2-15+ × 0.8-6 cm, 1-2-pinnatifid, lobes 3-14, narrowly linear-lanceolate to narrowly oblong-ovate, 1-16 mm wide, faces hirsute, gland-dotted. Heads 1-15, held well beyond leaves. Peduncles (1.5-)6.5-48+ cm (ribs tan, prominent). Phyllaries 5-14, outer linear, 4-14 × 0.5-2 mm, inner lanceolate-ovate, 0.8-3 × 0.8-2 mm. Paleae 2.3-3.5 × 0.5-3 mm, resin glands oval-oblanceolate, 0.6-1.5 mm. Ray florets 4-12; corollas yellow, purplish yellow, or maroon, sometimes bicolor (maroon/yellow), laminae lanceolate-ovate to elliptic-oblanceolate, 7-35 × 4-17 mm. Discs columnar, 10-50 × 7-12 mm. Disc florets 200-400+; corollas greenish yellow, often purplish distally, 1-2.5 mm; style branches 0.5-1.4 mm, proximal 2/3-3/4 stigmatic, apices rounded. Cypselae oblong, 1.2-3 × 1.2-2 mm, abaxial margins glabrous, adaxial margins and apices glabrous or ciliate; pappi (tan) usually of 1-2 toothlike projections, sometimes 0. 2n = 28. 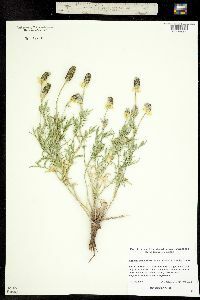 Flowering Mar-Nov. Prairies; 10-2200 m; Alta., B.C., Man., Ont., Sask. ; Ariz., Ark., Colo., Ill., Ind., Iowa, Kans., La., Mass., Minn., Mo., Mont., Nebr., N.J., N.Mex., N.C., N.Dak., Okla., S.Dak., Tenn., Tex., Utah, Wis., Wyo. ; Mexico (Chihuahua, Coahuila, Hidalgo, Nuevo León, San Luis Potosí, Tamaulipas, Veracruz). Ratibida columnifera is grown as an ornamental and is often included in wild flower plantings. Such activities may extend the geographic range of the species to roadsides and prairie-like habitats. Some variants of Ratibida columnifera have been treated as varieties or forms. 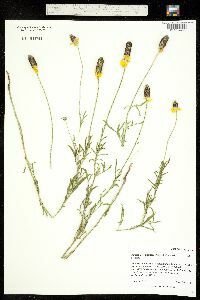 The most prominent of these is forma pulcherrima (de Candolle) Fernald, which is characterized by its showy, purplish yellow to purple rays; it is more frequent in the southwestern part of the range of the species. 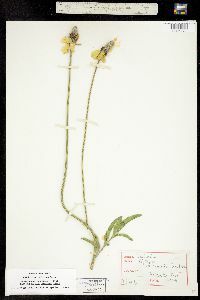 In the typical form, rays are yellow (E. L. Richards 1968). 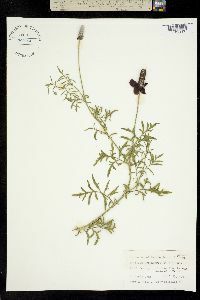 Some authors have argued that Ratibida columnaris (Sims) D. Don is the correct name for this species; J. L. Reveal (1968) and E. L. Richards (1968) provided synoptic discussions of the issue. 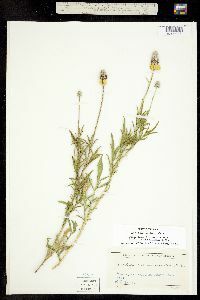 I have a specimen of this species collected in 1929 by Robert Hessler along the B. &. 0. Railroad about a mile and a half east of Irvington in Marion County. The rays are entirely yellow. 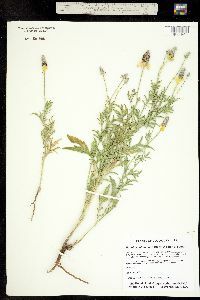 Hessler found only two specimens. Peattie reports it as naturalized in the Calumet District of Lake County but he does not tell us how abundant it is there. This species may be only a railroad migrant. 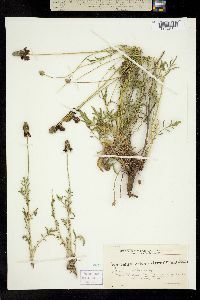 Taprooted, with clustered stems 3-12 dm, strigose or partly hirsute, generally leafy to above the middle; lvs pinnatifid or partly bipinnatifid, the ultimate segments linear or lanceolate, entire or nearly so, relatively few and often very unequal, generally many of or all them 1.5 cm or more; heads (1-)several or many, naked-pedunculate, the disk columnar, 1.5-4.5 cm, 2-4.5 times as long as thick; rays yellow or (f. pulcherrima (DC.) Fernald) partly or wholly brown- purple, 1-3.5 cm, spreading or reflexed; style-appendages very short and blunt; achenes with the inner margin fringed-ciliate to nearly smooth, usually slightly winged; pappus an evident awn-tooth on the inner angle of the achene, and often also a shorter one on the other angle; 2n=26, 27, 28, 34-38. Prairies and other dry, open places; Minn. to Mo. and La., w. to Mont., Tex., and n. Mex., and occasionally intr. e. June-Aug. Taprooted, with clustered stems 3-12 dm, strigose or partly hirsute, generally leafy to above the middle; lvs pinnatifid or partly bipinnatifid, the ultimate segments linear or lanceolate, entire or nearly so, relatively few and often very unequal, generally many of or all them 1.5 cm or more; heads (1-)several or many, naked-pedunculate, the disk columnar, 1.5-4.5 cm, 2-4.5 times as long as thick; rays yellow or (f. pulcherrima (DC.) Fernald) partly or wholly brown- purple, 1-3.5 cm, spreading or reflexed; style-appendages very short and blunt; achenes with the inner margin fringed-ciliate to nearly smooth, usually slightly winged; pappus an evident awn-tooth on the inner angle of the achene, and often also a shorter one on the other angle; 2n=26, 27, 28, 34-38. Prairies and other dry, open places; Minn. to Mo. and La., w. to Mont., Tex., and n. Mex., and occasionally intr. e. June-Aug.